Have you noticed in the last few weeks that it suddenly becomes a lot more difficult to keep a rally going during a game of squash? Perhaps you´ve blamed yourself, or maybe you´ve replaced the ball because you thought it was coming to the end of its life? Before getting frustrated, read on because the solution may be simpler than you could imagine. 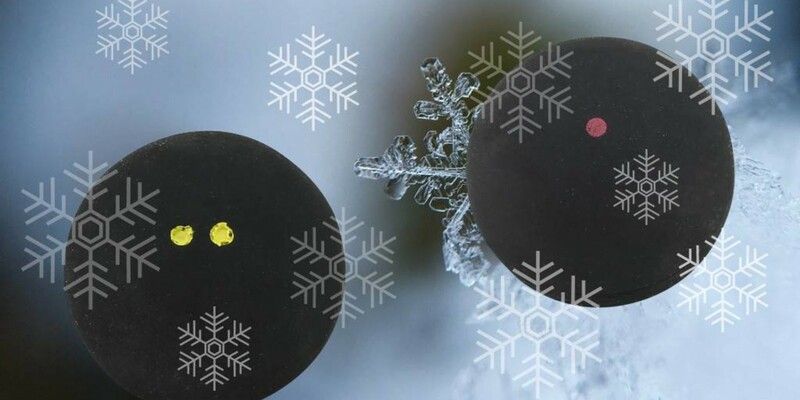 Due to the cold weather conditions we´ve had for the last few weeks it´s a lot more difficult to warm up the squash ball and keep it warm during the entire game. You notice this because the ball bounces less. A word of consolation: it´s not that you play worse but for once you can blame the ball! The weather conditions directly influence the rebounding power of the squash ball. If it´s freezing outside, the ball doesn´t bounce as much as usually. This is because the squash ball is hollow inside and the ball only bounces when the air inside the ball is warm. The warm air causes the pressure to increase and the ball to bounce properly. If the ambient temperature is lower and the front wall is cold, you have to hit the ball a lot harder to keep it warm and to reach the same bounce. You can solve this problem more easily by choosing a ball with a higher bounce on very cold days. If you always play with the Dunlop Pro Squash Ball with the double yellow dot, you could now try the Dunlop Competition Squash Ball with a single yellow dot. Or if you always play with the Competition ball, you can temporarily switch to the Dunlop Progress Squash Ball. You will see that you enjoy the game a lot more with this simple trick. That´s why it´s useful to also have a squash ball with a higher bounce in your squash bag. How to choose the right squash ball?